For those of you who haven’t been to Noosa (Australia) there’s a somewhat infectious triathlon culture that encompasses the popular beachside town. Like many others, Strength For Endurance Ambassador Chloe Kay, was quickly bitten by the "bug" and swimming, cycling and running soon became her way of life. As a previous party animal (although we’re not sure this has gone too far astray!) she swapped social engagements for swim sessions and hasn’t looked back since. Now working and living 5 hours inland in the rural town of Alpha, Chloe continues to pursue her love of triathlon. SFE: Did you grow up playing sport? CK: I swam and did ballet as a child until I was about 12. I wasn't great at either and didn't really enjoy them, I did love playing ocean girl and dolphin boy with my brother in our pool though - that is one of my best childhood memories. Mum also loves to share the story of how she had to push me off the blocks into the pool on club swimming nights! From High School to Uni I avoided exercise as best I could. I played water polo at Uni but mainly for the social aspect. SFE: So you were a latecomer to Triathlon, what did you do in your spare time before you caught the triathlon 'bug’? CK: Before moving to Noosa at the end of 2013 I lived (and loved) the party lifestyle. If you've ever been to Darwin you'll know how easy that would be. The weather is hot, the beers are cold and everyone's friendly! While I was studying full time, working part time and babysitting a lot I didn't really notice how sedentary my life was. But midway through my first year as a pharmacist I realised there had to be more than eat, drink, work, repeat. That's when I started to dabble in triathlon, but for the first year I read more tri magazines than I did train. Once I moved to Noosa I got really into the sport and turned from exercise being a chore to part of my lifestyle. "Turning up to a 10 hour day mentally and physically exhausted from a 2 hour run before work is neither smart nor sustainable." SFE: What do you do for work? CK: I'm a Pharmacist, at the moment in a little country town called Alpha in Central Western Queensland. My current job is pretty low stress however it still requires standing up all day and full mental alertness. This is something I've had to work with my coach on and give him feedback. Turning up to a 10 hour day mentally and physically exhausted from a 2 hour run before work is neither smart nor sustainable. So I've been lucky to have a coach that strongly believes we are in this sport for the long haul and adapts my program accordingly. SFE: Have you had many injuries since taking up the sport? CK: For the first couple of years I just swam, rode and ran without many issues. Then I increased the training volume exponentially (especially considering my lack of exercise for the first 26 years of my life!) which I think led to my injuries. From that point I had a myriad of complications; Plantar Fasciitis tear, Piriformis Syndrome and most recently a TFL tear - all stemming from weak core and hips. Only very recently have I realised that strength work isn't an optional extra on the training program, it's an imperative part. "Only very recently have I realised that strength work isn't an optional extra on the training program, it's an imperative part." SFE: Do you have much strength training experience? CK: No, no previous experience apart from Physio exercises. When I started being coached by my current coach he did an assessment on me at the gym and gave me a list of about 8-10 exercises to do once or twice a week. I'm not going to lie I found them difficult and complicated so it lasted for about two weeks and I stopped. The last two months I've been pretty diligent with my strength exercises from the Physio to get my glutes active again and strengthen the weakness in my hips. I live in rural Queensland so have no access to gym equipment or classes, which is why Strength For Endurance was of interest to me. I have learnt the hard way about the implications of weak muscles in triathlon/endurance sports, so if I am going to be able to run 84km in Ultraman (and increased volumes in training) then it’s imperative that I strengthen my weaknesses. SFE: What's your favourite and least favourite thing about triathlon? CF: My least favourite thing would probably be fatigued legs at work! Sometimes if I have done a hard ride or run in the morning my legs ache and I just feel like I want to lay down with my legs in the air and let the lactate drain away. My favourite thing is definitely the people, hands down. I love all the wonderful friends I have made in triathlon. But considering I do a lot of my training out here alone now I’ll give you a second favourite….the way it makes me feel. The post training endorphins, the sense of achievement, the hope, excitement and anticipation racing, then the finish line feels. It’s pretty cool to blow your own damn mind sometimes. What can I say, triathlon makes my soul happy. SFE: What motivational tips and tricks do you use when you're struggling to get out and train? CK: I am pretty lucky that I do enjoy and look forward to most training sessions, but no matter how much you love the sport you’re not going to feel like doing it every single day. So having a friend to meet or squad that you’ve committed to is a really good way of getting out the door. You don’t want to leave your friend stranded or continually make up excuses as to why you don’t go. Getting all your gear ready the night before also helps, for me I do this for wind trainer sessions (indoor riding), which is probably my least favorite session. So if the bike is set up and ready to go, all I need to do is get dressed, put the coffee pot on and go. I usually have my coffee during the easy spin warm up too, that helps! Just making it part of your routine is what I would recommend the most; you don’t get up and ask yourself "Do I feel like having a shower today? Do I feel like going to work? or will I just pull a sickie?" You get up and go. That’s what I do with training, it rarely crosses my mind whether I will train, and I just do it. CK: My first Ironman was in Mexico and I signed up for that right after my first 70.3. I was already going to America and saw it was on, I was like "you know what, crossing that finish line was the best feeling of my life....I am going to do an Ironman!". So 10 weeks later I did. I finished in about 13 hours, so not terrible considering the short lead up time and after that decided "Ok, next is Cairns - but I am going to train properly and hard for this one". And that’s how the love for endurance racing really began (and escalated). So these flippant and crazy ideas aren’t a rare occurrence for me! SFE: So you’re training for Ultraman Australia 2018. Tell us a little bit about your decision to enter and what your plan is for training and preparation? CK: So Ultraman Australia is a 3 day race, competitors have 12 hours to complete each day. My decision to enter was a bit of a last minute thing, my friend sent me the link saying entries close tonight! And I was like "eeekk this is it, should I or shouldn’t I? "….so I did! But it has been at the back of my mind for a while. It’s held in Noosa (where I am from) so I have watched it each year and spoken to athletes who have come into the pharmacy before and after the race. And friends, particularly the first year female winner Pip Holland - she planted the seed and has inspired me from day one. Probably what’s held me back in the past is the thought of running 84km on legs that are already exhausted from the other days, so I never really thought I would enter. But this year I had recently moved to Outback Queensland, I had a lot of spare time on my hands and was feeling a bit under stimulated by potential races. My plan for training and preparation is really to leave it up to the Coach. We have discussed a bit about how it will unfold but not in huge detail. I have just put 100% of my trust into him doing the research/planning and to program what’s best for me. He understands what I can handle as well as my limitations so I’m confident in leaving it up to him. At the moment we are just getting a nice base built and will build slowly and smartly from here. And obviously it’s not just the swim, bike, run and having enough hours in the week to fit in them all, it’s also strength training, adequate recovery and as work 5.5 days a week too, I'm sure it will be a full on 6 months. With Chloe our first priority will be to get on top of her niggles and injuries, we will need to make sure she is treating them appropriately, working with her coach and physio to ensure she is following the right program. With regards to her strength program, we have 6 months before she embarks on the Ultraman, which is a good chunk of time to work with. There will be races in the lead up which are great markers for us as part of her team to measure her progress, performance and level of conditioning. 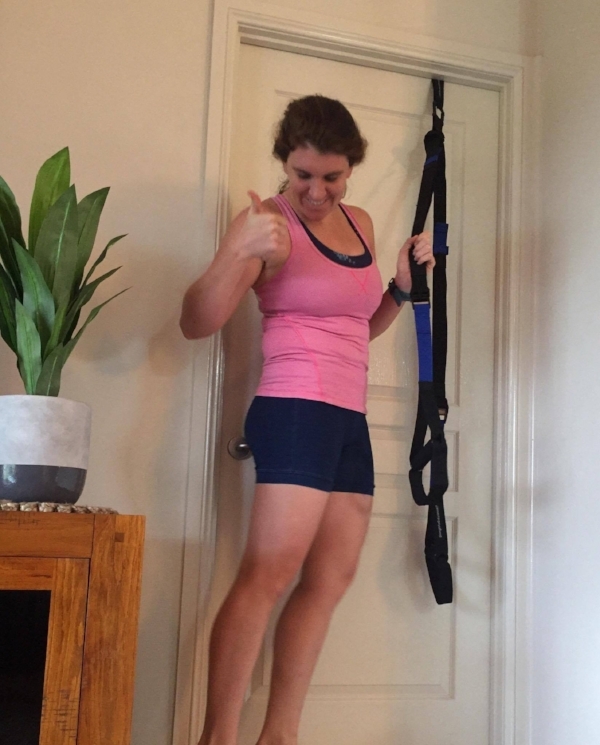 Establishing new habits and including strength training into her current program is essential, so I have suggested to Chloe that she sets up her StrengthForEnduranceKit in a particular area of the house, where she will just be able to walk in and start performing her program. Forming new habits are said to take up to 21 days (3 weeks) to become routine, so we have to find a number of ways to prevent ‘excuses’ from filtering in, and having the kit out and ready is one of my favourites. The program she will be following to start with will be focusing on improving the three main areas of performance, her Mobility, Actvation and Strength. This will be achieved through a couple of key exercises that relate specifically to her needs and focus on her weaknesses. This will amount to a 30-45minute session that she will be performing seperately to her swim, bike, run sessions making sure she has complete focus and energy levels for a safe and effective strength session. With an event like the Ultraman, Chloe needs to be strong! To complete such great distances we want her to be able to maintain healthy and strong form for as long as possible. The idea is to train to endure the event and not to just simply hang on! We want her to be able to walk away from the event ecstatic, not broken and unable to do anything for a long time.